Synopsis: “A moment. That’s all it takes. Arrow is still haunted by a childhood tragedy that shattered her safe, happy world. Marika is caught up in a nightmare from which there is no escape. In just 182 pages, Margaret Wild manages to weave such a heart-wrenching and believable story, it’s sure to stay on your mind for a very long time. 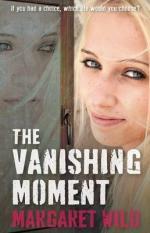 The Vanishing Moment was not at all what I expected it to be. I never thought an author could string such memorable prose in such a short book, but Wild did just that. The book alternates between three characters – Bob, Arrow and Marika – but not once did I want to skip ahead because they each had such honest stories to tell. I will admit that I was thoroughly confused as to where the story was going for a great part of the book, but I pushed the confusion to the back of my mind and let the beautiful writing take me on a journey. On a journey from Sydney to the shores of Shelley Beach (you have no idea how stoked I was to be able to recognise all of the sites and places mentioned in the book). Bob was the most confusing character at first, his chapters always talks about a memory he remembers. We are not provided with any clues as to why he’s talking about his childhood, but they were interesting to read none-the-less. For a great deal of the novel, you are kept in the dark about him, why he’s important and what he has to do with Arrow or Marika at all. I’m not going to spoil it, but his role does tie in with them once they’re all at Shelley Beach together. Arrow was also an interesting character. She’s described as a lazy girl who stays at home and rarely makes time to see her friends anymore as she’s taking a gap year. At first we’re left in the dark as to why she’s like this but slowly it gets revealed to you. Arrow and her family once lived on Shelley Beach, that was until something horrible happened to the family of her childhood best friends. Ever since then, they have lived in Sydney, but Arrow has never forgotten how one decision on her part has affected her whole life. And she can never forget that voice in her head which whispered, “I can Interchange, Arrow. Shall I?” Yes, the story hints at science-fiction elements but not much. Marika, unlike Arrow or Bob, has led a pretty normal life. That is, until her baby brother disappeared during their outing to the aquarium. Her guilt for what happened shattered her life and she finds herself staying at her family’s holiday home in Shelley Beach by herself. While there, she meets Arrow who used to live in the same house. They become acquaintances and soon exchange stories about that “moment” in life that changed everything. While this book is predominantly character driven, there’s also a very good plot that ties the three characters together. This “moment” that changes all their lives has them wondering about “what ifs” and such, but essentially the novel is about finding comfort in the consequences of their past actions. I’m not ashamed to say I sobbed like a baby near the ending because it is an emotional book (and I’m a sensitive cryer), so have your tissues ready! However, the reason I can’t give this book a solid five stars is because of it’s ending chapter – I found it unnecessary and the book would have been much better if it’d just left its audience wondering about the “what ifs” in a different way. On the other hand, if you don’t think a book can be beautifully written with solid characters and plot in only 182 pages, then let this book challenge that opinion. This is my first Margaret Wild book, but I will definitely be picking up more from now on!